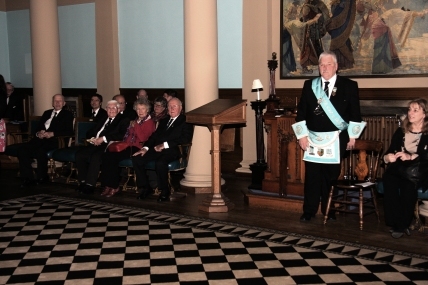 On Wednesday 17th December 2014 the Lodge held its festival of St John and annual carol service. In the past these were two separate meetings but in recent years they have been combined. The festival of St John is to remember those who have passed to the Grand Lodge above in the past year. This was attended by Lodge members, a good number of visiting Brn and a fine deputation from the PGL of Perthshire East headed by the PGM Bro Ronnie Forbes. 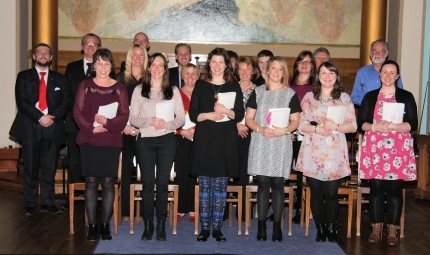 On closing the Lodge the RWM, Bro Jim Thomas, invited our families and friends into the temple for our carol service and this year we were pleased to welcome 17 members of the Perth Amateur Operatic Society led by Andy MacDonald their director of music and Pam Coventry their President. everyone joined in community singing of two traditional carols and then the choir treated everyone to 25 minutes of many traditional carols This included a carol by their equivalent of the 3 tenors. We have to congratulate Andy not only for his leadership in conducting the choir but in the manner in which he mastered our 1870 American foot pedal operated Reed organ - no easy task!! The choir finished with their own arrangement of Jingle Bells, a very fitting end to a wonderful carol service. As they are a Charity the Lodge showed their appreciation to the members who had given of their time in joining us by presenting a Cheque for £100 to the Society.